1. On the Crazy servers it is expected that everybody show respect for all other players, and in particular for the admins, referees, and members of ExtremeMaximum Clan. 2. If an admin and referee are both present at the server, the admins decision prevails. 3. Cursing is allowed on the server, but the overuse of excessively vulgar language will result in a time ban based on the discretion of the admins. In the event of a repeat offense of this type, the administrator may extend the time ban at his own discretion. 5. Using offensive nicknames which contain profanity, etc., is strictly prohibited.  In this situation, the administrator may remove the player from the server. It is also unwelcome to play under different logins; if such practices are detected, the player will be punished according to the level of the offense. 6. Provoking or ridiculing other players is strictly prohibited. 7. Impersonating a server administrator or a member of the Pure Hate clan will results in an immediate lifetime ban (GUID, IP) from all Crazy servers. 8. Undermining any admin's decision can result in immediate removal from the server. If you believe a =[E|M]= admin has acted in error, settled the issue through proper channels via the appropriate forum section citing reliable instances including screenshots/demos if applicable. 9. Using cheats/hacks in any form is strictly prohibited. Infraction of this type will definitely result in at least a temporary ban by the administrators. 10. Extended camps will be punished with the backfire command (you take damage instead of your enemy) or other various forms of punishment. If the player does not comply to disciplinary measures, he will be kicked from the server. 11. Overflowing the chat with spam will result in the player in question getting muted. The second step will be kicking the subject from the server, and the third action will be a time ban, of who's length is to be decided by the admin. 12. If a player unintentionally violates one or more of these rules, the admin has the right to give him the benefit of the doubt, and withhold punishment. 13. Players with ping higher than 400 may be removed from the server by the admin. 14. The final decision regarding the penalty to a player for breaking the rules is left on the admin. 15. Any other practices not mentioned here that are likewise aimed at destroying the integrity of the game and/or server are likewise prohibited. Do you have a link to the mod, maybe I need to reinstall it..
Well it changed my weapons sounds on the pheonix mod, but still scrambled text on xs mod. I deleted the xsmod file folder and re-installed it in noble pro file. I noticed goldrush rar file is in noble pro file as well. Then reinstall the game and use the Goldrush winrar and unwin in like this: IN the main folder. Then if your not sure just get on my teamspeak and i will help you. Man, I hope there is another way… I got tons of map files. I suppose I could back those files up but the main thing is my unique key. If I re-install the game, it will default back to a shared key.